Net income at global casino operator Las Vegas Sands Corp rose 137.9 percent year-on-year for the fourth quarter, and 68.0 percent for full-year 2017. Such net income was US$1.21 billion and nearly US$2.81 billion respectively, compared to US$509 million and US$1.67 billion in the prior-year periods. Las Vegas Sands reported fourth quarter revenue of approximately US$3.44 billion, up 11.7 percent year-on-year. Full-year 2017 revenue increased by 12.9 percent year-on-year to US$12.88 billion, the company said in its Wednesday announcements. Las Vegas Sands is the parent of Macau-based casino operator Sands China Ltd. The group paid a quarterly dividend of US$0.73 per common share during the fourth quarter. Las Vegas Sands announced that its next quarterly dividend of US$0.75 per common share would be paid on March 30, 2018, to shareholders of record on March 22, 2018. In addition, the company repurchased US$75 million of common stock – representing 1.1 million shares at a weighted average price of US$68.99 – during the quarter ended December 31, 2017. “Our Macau operation produced its best quarter since the third quarter of 2014, with adjusted EBITDA [earnings before interest, taxation, depreciation and amortisation] reaching US$731 million,” said the group’s founder and chairman Sheldon Adelson, in prepared remarks issued with the results. VIP gambling turnover at the Venetian Macao rose 16.4 percent year-on-year and at the Parisian Macao 16.1 percent in the fourth quarter. But at Sands Cotai Central, the quarterly high roller turnover declined by 16.7 percent, while at Sands Macao it fell 46.7 percent. “In terms of VIP, Sands [China] revenue declined by 14 percent quarter-on-quarter, much weaker than market growth of 5 percent quarter-on-quarter in fourth quarter 2017,” said a Wednesday note from banking group Morgan Stanley, citing a different measure for VIP performance. “Majority of the [quarterly] upside came from premium mass revenue of US$666 million (+33 percent quarter-on-quarter, +52 percent year-on-year). This was helped by renovated rooms at the Venetian [Macao] and Four Seasons [Macao],” added Morgan Stanley. On a U.S. generally accepted accounting principles (GAAP) basis, total net revenues for Sands China increased 12.9 percent to US$2.10 billion in the fourth quarter of 2017, compared to US$1.86 billion in the prior-year period. Net income for Sands China increased 49.1 percent to US$519 million in the fourth quarter of 2017, compared to US$348 million in the fourth quarter of 2016. On a GAAP basis, full-year 2017 total net revenues for Sands China increased 15.7 percent to US$7.74 billion, compared to US$6.69 billion in 2016. Net income for the Macau unit increased 31.1 percent to US$1.60 billion in 2017, compared to US$1.22 billion in 2016. In the group’s earnings call following the results, Mr Adelson mentioned the US$1.1 billion capital pledge for the revamp of Cotai facilities including a rebranding of Sands Cotai Central as the Londoner Macao was a sign of the group’s commitment to the Macau market. The current Macau gaming rights of the Macau unit are due to expire in 2022. “Our decision to reinvest and develop the Londoner Macao reflects that long-term commitment to Macau and our confidence in its future,” stated Mr Adelson. In the group’s Singapore operation, Marina Bay Sands’ revenue increased 14.1 percent year-on-year to US$825 million and adjusted property EBITDA increased 24.6 percent to US$456 million. Adjusted property EBITDA margin increased 470 basis points to 55.3 percent. The group said that in the fourth quarter of 2017, there was approximately 1 percent fewer rooms available at Marina Bay Sands compared to the same quarter of the prior year, while revenue per available room (RevPAR) decreased 3.4 percent to US$395. Singapore rolling chip volume decreased 4.0 percent compared to the prior-year quarter, to US$7.93 billion. Mass-market chip drop was US$925 million during the quarter, with a mass-market chip win percentage of 27.9 percent. Slot handle increased 8.5 percent to US$3.67 billion for the quarter compared to the year-earlier quarter. In its summary of Macau operations for the quarter, Las Vegas Sands stated the Venetian Macao generated revenue of US$844 million and adjusted property EBITDA of US$324 million, an increase of 23.7 percent, with an adjusted property EBITDA margin of 38.4 percent, up 130 basis points compared to the prior-year quarter. In the final three months of 2017, the Venetian Macao had approximately 6 percent more rooms available compared to the same quarter of the prior year, while RevPAR increased 14.6 percent to reach US$228. 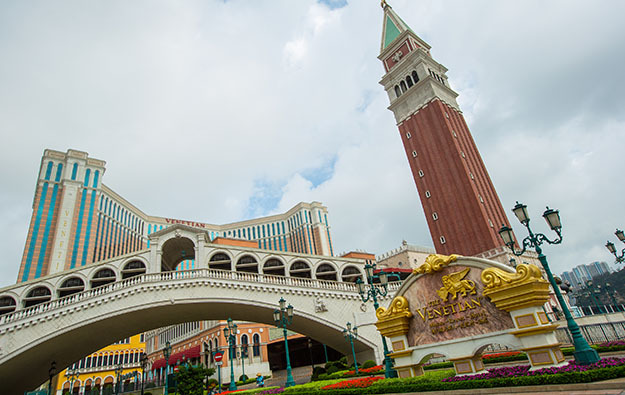 The Venetian Macao’s mass-market chip drop increased 21.5 percent for the quarter, reaching US$2.08 billion, said the group. Mass chip win percentage was 26.8 percent, compared to 25.1 percent in the fourth quarter of 2016. Rolling chip volume was US$8.02 billion, compared to just under US$6.89 billion in the prior-year period. Slot handle was US$877 million for the quarter. Revenue and adjusted property EBITDA for fourth-quarter 2017 at Sands Cotai Central were US$557 million and US$202 million, respectively, resulting in an adjusted property EBITDA margin of 36.3 percent, an increase of 660 basis points over the prior year. Adjusted property EBITDA increased 53.0 percent compared to the prior-year quarter. RevPAR increased 20.0 percent compared to the fourth quarter of 2016. Sands Cotai Central’s mass-market chip drop increased 20.9 percent to US$1.72 billion in the fourth quarter; with a mass chip win percentage of 21.2 percent. VIP rolling chip volume was US$2.35 billion for the quarter, compared to nearly US$2.83 billion a year earlier. Slot handle was US$1.29 billion for the quarter. Revenue and adjusted property EBITDA for the fourth quarter of 2017 at the Parisian Macao were US$332 million and US$89 million, respectively, resulting in an adjusted property EBITDA margin of 26.8 percent. In the quarter there were approximately 3 percent fewer rooms available compared to the prior-year period, while RevPAR increased 19.0 percent. Mass-market chip drop at the Parisian Macao increased 13.5 percent for the quarter, reaching US$1.02 billion, with mass-market chip win percentage of 19.8 percent, compared to 18.3 percent in the prior-year period. Rolling chip volume was US$3.85 billion for the quarter, compared to US3.31 billion in the prior-year quarter. Slot handle was US$1.01 billion for the quarter. “Ramp up at Parisian [Macao] was disappointing and partly affected by ongoing room renovations (recall that Parisian is reducing its room inventory by creating more suite product – something that should be positive in the longer run). The Parisian room reduction and suite expansion should be fully completed by end of 2019,” said a note from brokerage Sanford C. Bernstein Ltd. The Las Vegas Sands management said at the conference call it expected the premium mass and VIP performance at the Parisian Macao to improve in long term after the renovation. “I think the Parisian [Macao] has captured the most important segment of all the base mass. However, the room product we built at the Parisian just isn’t sufficient to meet the premium mass demand and that will change with the addition of 300 more suites that come on board in 2018. In addition to the Four Seasons apartments … available to us for using sometime in probably second quarter of 2019,” said Mr Goldstein. “So, I think with those 300 more suites and 300 or 400 of the Four Seasons you’ll see a much stronger premium mass customer at the Parisian,” the executive added. The Plaza Macao generated revenue of US$180 million and adjusted property EBITDA of US$71 million, resulting in an adjusted property EBITDA margin of 39.4 percent in the fourth quarter of 2017. In quarter there were approximately 13 percent more rooms available compared to the prior-year period. Mass-market chip drop increased 24.3 percent compared to the same quarter last year, reaching US$389 million, with a mass-market chip win percentage of 21.9 percent. Rolling chip volume increased 6.7 percent to reach US$2.66 billion for the quarter. Slot handle increased 15.7 percent to US$125 million during the quarter. Sands Macao generated revenue of US$154 million and adjusted property EBITDA of US$40 million in the fourth quarter, with an adjusted property EBITDA margin of 26.0 percent. Non-rolling chip drop was US$615 million during the quarter, while slot handle was US$609 million. Rolling chip volume decreased to US$748 million for the quarter, compared to US$1.40 billion in the prior-year period.